A medium-sized collaborative robot (cobot) for handling, picking and packing applications is the fifth model to join FANUC’s cobot portfolio. 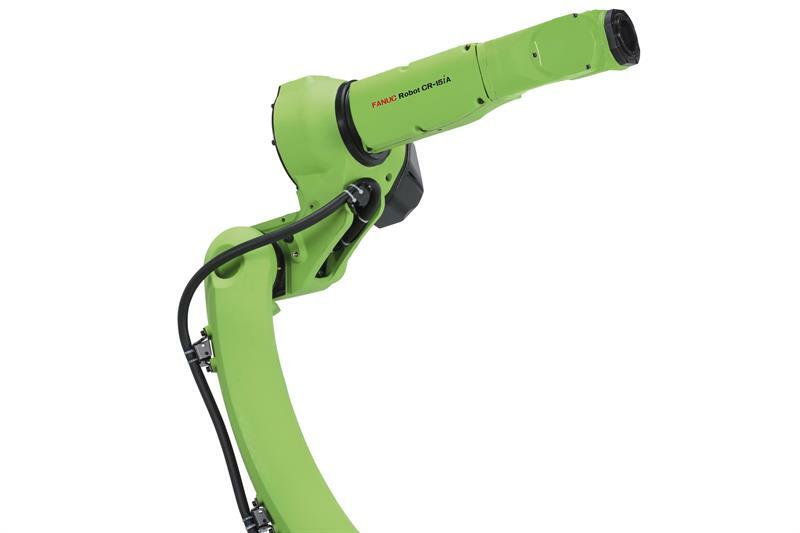 The CR-15iA benefits from the same integrated sensors and responsive ‘touch-to-stop’ functionality as the rest of FANUC’s cobot range, which are painted green to distinguish them from the company’s traditional yellow robot series. <Content>If the arm of the CR-15iA comes into contact with a fixed object or person, it gently halts and retracts. A safety system ensures that the cobot stops at a maximum contact force of 150 N, however, this can be reduced even further if required. The CR-15iA is therefore able to work safely and co-operatively alongside human operators, without the need for fences or barriers. Launched at Automatica in Munich earlier this year, the CR-15iA mirrors the design and mechanics of the industrial M10iD range, making it easy for users to integrate cobots into existing robot cells, with the same parts inventory. Offering a maximum payload of 15 kg and a reach of 1,441 mm, the CR-15iA bridges the gap between the CR-35iA – which FANUC says is the strongest cobot in the world – and the small CR-7 range. Further to the cobot’s sensors, which are located on the base of the unit rather than its arm, the CR-15iA comes with flexible mounting options to suit the floor, ceiling or wall. The cobot’s relatively small footprint also makes it suitable for warehouses and packing lines with limited floor space. For manufacturers new to collaborative, automated working, the CR-15iA comes with the R-30iB Plus controller, an intuitive user interface that guides operators through set-up and programming. The controller also has hand-guidance functionality, which allows an operator to lead the cobot through handling operations. Manufacturers can further enhance the functionality of the cobot by integrating FANUC’s iRVision, a visual detection system for managing production settings, as well as the company’s Force Sensor, a detection system for force and torque that allows the units to undertake work previously done by craftsmen.